Your knee may look like a simple structure from the outside, but on the inside it's a joint that's made up of many components, according to the American Academy of Orthopaedic Surgeons. Because your knee is so complex, it's highly susceptible to various injuries. And if something goes wrong with one tiny part of your knee, the whole mechanism is at risk of giving out when it attempts to go through routine activities such as bending and extending. A sprain is a stretch or tear of a ligament. Common sprains in your knee involve damage in your medial collateral ligament or anterior cruciate ligament. If you have sprained a ligament, you may have heard a popping or snapping sound when you injured it. You may also notice that you can't put any weight on the affected leg, you have pain when you try to bend your knee, you have swelling in your knee and your knee gives way or buckles when you're walking or otherwise putting any weight on it, according to the UCSF Medical Center. It's also possible to feel as though your knee might give out -- giving you a sense that your knee is unstable with activities such as bending -- without actually having instability in your knee caused by torn or stretched ligaments. Patellofemoral dysfunction, which is also sometimes called runner's knee, can also lead you to feel as though your knee will buckle when you bend it. Runner's knee occurs when your kneecap doesn't track properly over a groove in your thighbone when you bend and straighten your leg, according to the website Kids Health, part of The Nemours Foundation's Center for Children's Health Media. This can also cause pain because it irritates the groove and may wear away cartilage beneath your kneecap. 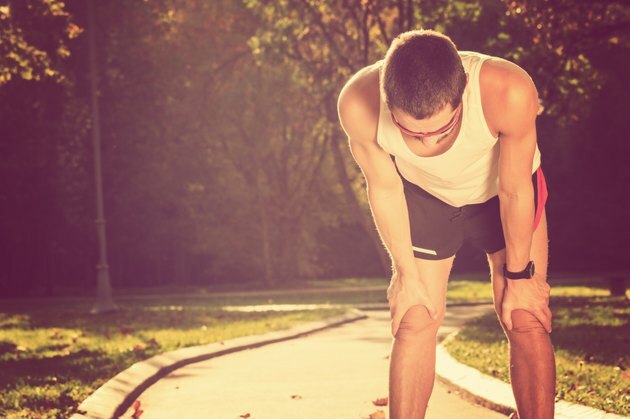 Some of the most common symptoms of runners knee are pain and tenderness behind or on the sides of your kneecap, swelling in your knee, worsened pain when you bend your knee and pain when you sit with a bent knee for an extended period of time. Your doctor may use a series of assessment tools when she's trying to determine what's causing your knee to buckle when you bend it. She will take a medical history, asking questions about how long you have had symptoms and whether you know of a time when you injured your knee. She may also press on your knee and take it through actions such as bending, rotating and straightening it to feel for any injury. Depending on the severity of your condition, she may also ask you to walk around, bend and straighten your knee on your own, according to the American Academy of Orthopaedic Surgeons. Your doctor may also order X-rays and an MRI to assess your knee from the inside. The treatment for your knee will depend on the underlying cause. If you have runner's knee, your doctor may assign home care treatment strategies such as resting and icing your knee, taking anti-inflammatory medications and doing strengthening exercises once the swelling diminishes. If you have a ligament sprain, the treatment also depends on the severity of the sprain. If your sprain is mild to moderate, your doctor may prescribe physical therapy and pain reduction methods such as those used for runner's knee. A complete ligament tear usually requires surgical reconstruction or repair, according to the Sports Medicine Institute at the University of Minnesota Orthopaedics. Will Walking Re-Tear a Meniscus?